Hydro Spy, LLC provides a variety of hydro excavation (or vacuum excavation) services in San Antonio, Texas and the surrounding areas: San Marcus, Kennedy, Kyle, Seguin, Kerrville, Lockhart, Canyon Lake, Pleasanton, Schertz, Hondo, New Braunfels. Our project experience in San Antonio includes massive trenching efforts for the installation of electrical duct banks, pot holing to locate underground utilities, big box manhole excavation, under slab tunneling and drainage remediation, pipeline excavations, pier shafts for light standards, pipe supports. We have also performed vacuum excavation services for the repair of hydraulic elevator shafts. 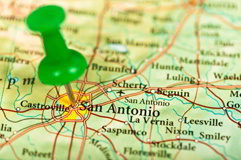 We serve a cross-section of industries in the San Antonio area, including civil and municipal construction, TXDOT projects and general construction contractors. To get an accurate quote or estimate for your project, give us a call, email us or complete one of our secure contact forms and one of our experienced estimators will be happy to serve you. Or, if you just want to learn more about hydro vacuum excavation and how the technology might be able to facilitate efforts on your job sites, call us now. We will answer your questions and offer clear solutions without a lot of sales talk.